“I always thought detention was for other people,” says Jed Berg, a sixteen year old “golden boy” who lives in Duluth, Minnesota. For Jed, life couldn’t be sweeter. In the space of six months he got his driver’s license, landed a major girlfriend and made number-one singles in varsity tennis. But here he is in after-school detention. “Preppies in a downward spiral are fun to watch,” says a pierced, tattooed girl–who is more insightful than she knows. 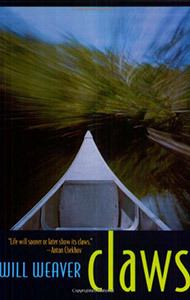 Claws is set in northeastern Minnesota, including Duluth and the Boundary Waters Canoe Area Wilderness. But rather than wild animals, the “claws” in question refer to a line by Russian writer Anton Chekhov. “For every happy man, life sooner or later will show its claws,” he wrote. How Jed deals with life’s adversity, including bad decisions and downright bad luck, reveals unpleasant truths about himself. “[G]ood choice for fans of more serious realistic fiction.”—School Library Journal.